Food makes the world go round. Believe me when I say this, as nothing connects friends and families closer than food, even more than the latest spate of any social media platform or mobile chat apps. Being a family man, with two kids constantly fighting for attention and whatnots, it's always during meal times that we have a sense of togetherness and calm. Mcdonald's McNuggets has always been our go-to comfort food when the wife and I do not have the time and energy to whip up a meal at home. Which brings us to today's posting about the latest campaign from McDonalds. Share a box of Chicken McNuggets with family & friends. Now with 2 new sauces - creamy French Cheese & sweet Honey Mustard! Dip ‘em & Share ‘em! I've always been a big fan of McD's chicken nuggets as they're made from boneless chicken breast and thigh meat chunks (think healthy). The batter itself had that crispy tempura feel, just the right size for a quick bite. My two boys love these to bits. I ordered some the other day to surprise my family as I found out they have come out with 2 brand new sauces, the creamy French Cheese and sweet Honey Mustard. Must try 'lah'. Family time is about sharing quality time with each other, and what better way than to emulate the concept of sharing by presenting my loved ones with a box of Chicken McNuggets. Dip ‘em, Share ‘em! What transpired that evening when I brought back the box of McDonald's Chicken McNuggets was a heartwarming moment to say the least. Now with 2 new sauces - creamy French Cheese & sweet Honey Mustard! Dip ‘em & Share ‘em! The kids went from being super excited, to being super nice, with baby Karlson feeding Martin, and Martin feeding the mum. Of course, dipping into the 2 new sauces is a must. Check out the video below of my two lovely boys with Janice, my better half. For more information on the McDonald's Chicken McNuggets' Dip 'Em Share 'Em campaign and promotion, do check out McDonald's Malaysia website at http://www.mcdonalds.com.my/promotion or their Facebook page at www.fb.com/My.McDonalds . Now go get a box (or two) today itself and share the love! Only one outlet here and parking is such a pain, so I have not been for years and years. Used to when it was at another place, in a shopping complex, ground floor. The only time I eat fast food is when I am travelling and on the rush to catch my transport. When I am home, I don't have the chance. So, will KIV this the next time I am on the road. Great, i also like this mcnugget very much with the new sauce! oh im going to love the french cheese...the sauce looks so thick and gooey! my kids favourite meal of course. Hehe.. but cannot everyday eat, once a month maybe. My girls can have nuggets everyday! Apparently they love McD sweet and sour sauce a lot!!! 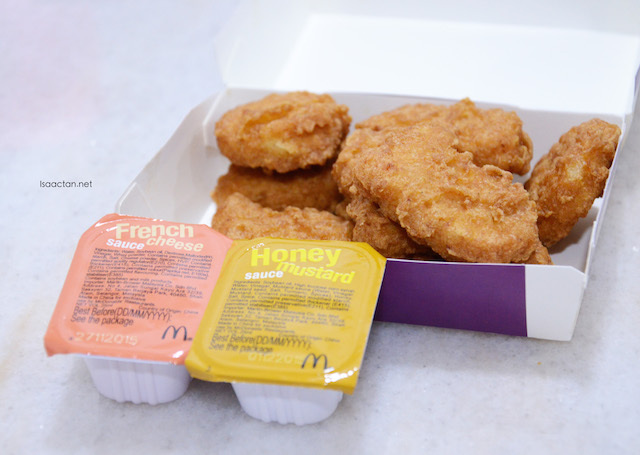 I want to try out the Honey Mustard.. i have not tried that yet... is it nicer compared to the cream cheese? I am not a kid but I like nuggets as well. So I have tried both and I prefer the French Cheese than the Honey Mustard. Nice video, is it hard to do? It's nice and addictive lehh! Haha please dont tempt me..